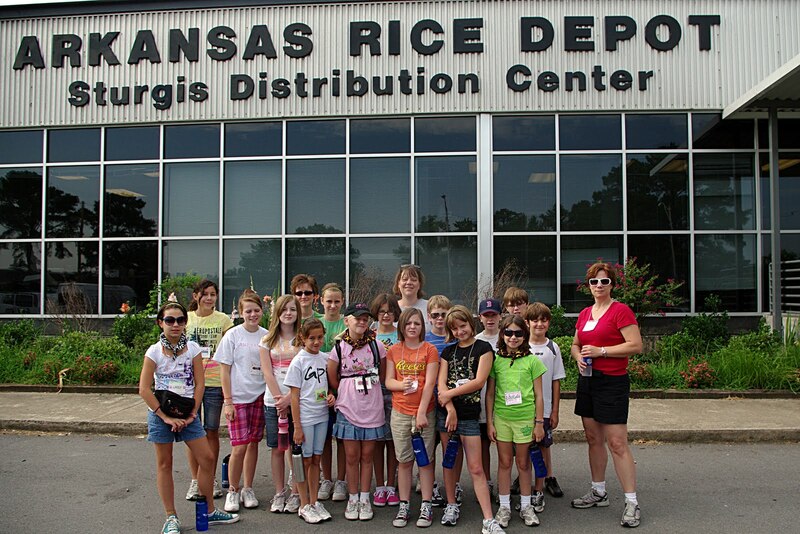 Today, our last "full" day of work, we spent the morning sorting cans of food at the Arkansas Rice Depot. 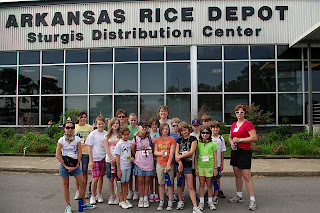 The Rice Depot is a hunger ministry that works with a variety of groups including food banks throughout the state, a senior feeding program and a school feeding program. We sorted two pallets of cans (many donated from Allen Canning) into "sets" of 80 cans - i.e. 80 cans of green beans, 80 cans of white potatoes, 80 cans of hominy, etc. The kids worked really hard to sort the food - without complaining. I think if we would have tossed them another pallet or two to sort, they would have jumped in willingly. We sorted enough food so that tomorrow's senior feeding program outreach can happen without extra prep. We also helped sort the remaining food - what wasn't needed or could be made into 80 can sets - so that next month's "sorting" is already started. --Want to pray for the Depot? They are in need of a larger freezer - to keep protein on hand for the various food banks. They also need more (on a continual basis) the emergency meal kits. These kits are distributed by UMCOR (United Methodist Committee on Relief) and the American Red Cross during natural disasters in Arkansas. Most recently, the Red Cross distributed emergency meal kits after the flooding in central Arkansas. After we finished at the Depot, we made an unscheduled visit to the Conference office. The picture will be posted later, but let's just say, we "invaded" the Bishop's office, and took over his chair! After lunch, and a mid-day TAG time, we loaded up and went to the Splash Zone - an outdoor water park at the Jacksonville City pool. The pool came complete with two LARGE water slides. Those pictures will be coming....let's just say, there's a few humorous ones! We finished up the evening with supper at Cici's Pizza, and then worship with John and Lali Palmer (and crew!) It was a great time of worship. Now it's 10:30 and we're trying to "wind" the kids down.